At Australian-Shepherd-Lovers.com we are dedicated to protecting your data and privacy. We recognize that your privacy is important. This document outlines the types of personal information we receive and collect when you use Australian-Shepherd-Lovers.com, as well as some of the steps we take to safeguard information. This will help you make an informed decision about sharing personal information with us. Australian-Shepherd-Lovers.com strives to maintain the highest standards of decency, fairness and integrity in all our operations. Likewise, we are dedicated to protecting our customers' and online visitors' privacy on our website. Australian-Shepherd-Lovers.com uses information from Google Analytics to track the number of visits to the website, browsers and operating systems. No personally identifiable information is obtained from these cookies. We use the information that Google Analytics generates relating to our website to create reports about the use of the site. These reports allow us to update the site and improve your usage of it. Australian-Shepherd-Lovers.com uses StatCounter to analyze the use of this website. StatCounter is an online service which helps us to understand our visitors; for example, how visitors find our website, how long they spend on our site, which web pages they are most interested in, etc. We use StatCounter because better understanding how visitors are interacting with our website helps us to improve the content, design and functionality of our site. This allows us to offer a better online experience to our visitors. 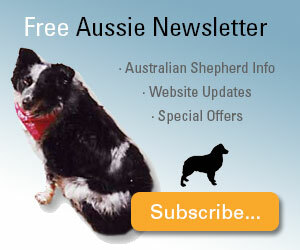 We receive an affiliate commission for some of the products and services sold on Australian-Shepherd-Lovers.com. The affiliate services platforms we use are Amazon, ShareASale, ClickBank, CJ Affiliate by Conversant, Rakuten Linkshare, SunFrog, Awin, Etsy, PepperJam Network, Dr. Jones' Natural Pet, Affordable Agility, Vitality Science, and E-junkie. Australian-Shepherd-Lovers.com uses Facebook pixels to determine the effectiveness of some Facebook ad campaigns. You can change your Facebook ad settings here. You can learn more about cookies and how to disable them at the About Cookies website. If you choose to refuse Australian-Shepherd-Lovers.com's cookies, you may not be able to fully experience the interactive features of the site. Australian-Shepherd-Lovers.com may collect personally identifiable information from you in a variety of ways, including, but not limited to, when you visit our site, register on the site, or fill out a form, and in connection with other activities, services, features or resources we make available on our site. On Australian-Shepherd-Lovers.com there are links to Facebook, Pinterest, Twitter, Instagram, YouTube, Minds, and Gab. When you click on them or leave a comment, your browser connects directly with that site and sends information such as your IP address, the date and time of your visit and information about how you use the social site. To prevent Facebook collecting your data, you should log out of your Facebook account while using this site. If we sell Australian-Shepherd-Lovers.com, the information we have obtained from you through your voluntary participation in our site may transfer to the new owner as a part of the sale so that the service provided to you may continue. In that event, you will receive notice through our website of that change in control and practices, and we will make reasonable efforts to ensure that the purchaser honors any opt-out requests you might make. Some information is collected by third-party services. These include Aweber and AddThis. Aweber is an email service we use to contact you and send information you have requested by subscribing to one of our mailing lists. 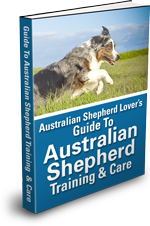 These include The Aussie Bi-Weekly Special Feature, the update notification list for purchasers of our ebook "Guide To Australian Shepherd Training & Care", and the contact list for breeders listed in our directories. Australian-Shepherd-Lovers.com is a participant in the AddThis program, which provides online tools that leverage data to help publishers understand their audiences and drive traffic to their sites. Your data may be transferred on a global basis. Addthis will transfer this data to countries (including the United States) where data protection laws may differ from those in the originating country. Transfers of personal information to countries outside the European Economic Area will be subject to the requirements of the European Union Standard Contractual Clauses. If you do not wish your data to be collected by AddThis, you may opt out by visiting optout.aboutads.info or the NAI opt out program.